Selegiline is used to treat Canine Cognitive Dysfunction Syndrome. It can also be used to treat symptoms associated with pituitary-dependent Cushing's Disease in dogs. 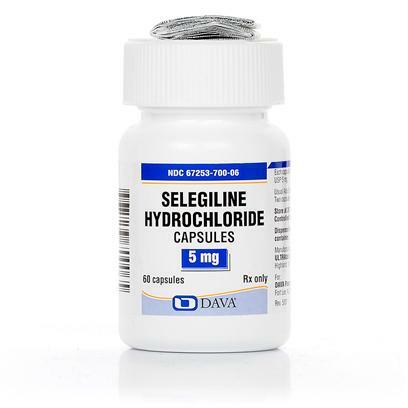 Selegiline comes in easy-to-administer oral tablets with five different strengths. Selegiline is a monoamine oxidase inhibitor (MAOI). Usage of selegiline is meant to result in enhanced catecholaminergic nerve function and increased dopamine levels helping dogs with cognitive dysfunction caused by aging. Not meant for dogs with aggression issues. Decreased appetite, drooling, vomiting and diarrhea, fatigue, confusion, restlessness, hearing loss, trembling, itching, hair loss, anemia (pale gums). Repetitive behaviors (ex. walking in circles, obsessive interest in something). If your dog suffers an allergic reaction such as hives, swelling of lips, tongue or face or difficulty breathing seek immediate emergency veterinary medical attention and discontinue dosages. Other less serious side effects may occur such as nausea or upset stomach, diarrhea or headache. If these, or any other side effects seem unusualy or bothersome to your animal talk to your veterinarian. Possible interactions may occur with ephedrine or other MAOI's. Discontinue selegiline at least 14 days prior to starting treatment with some narcotic pain killers (ex. Demerol), phenylpropanolamine, SSRI's (ex. fluoxetine) and tricyclic antidepressants (ex. amitriptyline). Some narcotic pain killers (ex. Demerol), phenypropanolamine, SSRI's (ex. fluoxetine) and tricyclic antidepressants (ex. amitriptyline) should not be used within 5 weeks of administering selegiline. selegiline hydrochloride, citric acid, lactose monohydrate, maize starch, magnesium stearate, povidone and talc. Give your dog the recommended dosage (typically one pill) every morning.